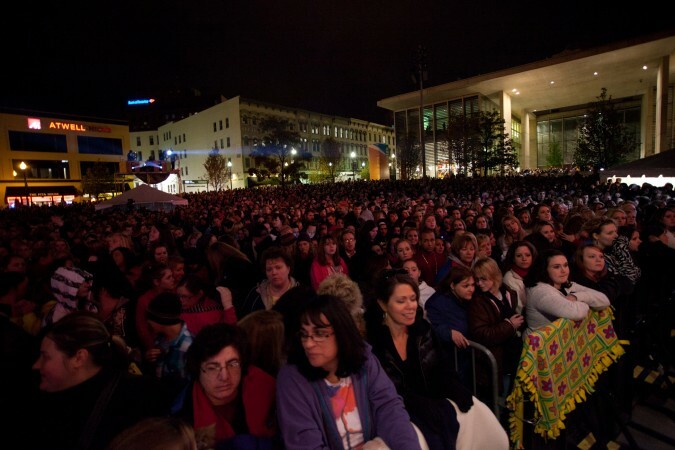 The culmination of the sixth annual event, the 2014 ArtPrize Awards will unfold in a two-part event as the ceremony at Grand Rapids Civic Theatre is broadcast live at a city-wide street party in Rosa Parks Circle. GRAND RAPIDS, Mich. September 10, 2014 – ArtPrize, the radically open, international art competition today announced plans for the 2014 ArtPrize Awards, rewarding everyone’s curiosity after 19 days of conversations, debates, exploration and voting. The culmination of the sixth annual ArtPrize will unfold in a two-part event on October 10—an intimate ceremony at the Grand Rapids Civic Theatre which will be broadcast live by WOOD TV8 at the Community Celebration at Rosa Parks Circle. And everyone is invited. An historic institution in West Michigan and one of the top five community theatres in the nation, the Grand Rapids Civic Theatre serves over 120,000 audience members and 1,600 students annually with the dedicated assistance of over 800 volunteers. The nonprofit organization celebrates the burgeoning live theatre community, bringing world-class shows to the stage every season and engaging viewers of all ages and backgrounds. Their commitment to making the arts accessible to anyone made it a natural fit to host the 2014 ArtPrize Awards—the finale event for a contemporary art competition designed for everyone to experience, regardless of background, and produced through the collaborative effort of the ArtPrize staff, Artists, Venues, Sponsors, and Volunteers. The Meijer Majestic Theatre at the Grand Rapids Civic Theatre will offer an intimate, beautifully furnished and equipped space for nominated Artists, Sponsors, ArtFans, credentialed media, and special guests to gather together to celebrate and honor the 2014 ArtPrize Artists. Central to the ArtPrize event since its inception in 2009, the public fuels the conversations and debates that make ArtPrize unique and undeniably intriguing in the contemporary art world. In recognition of this invaluable contribution to the success of the event, ArtPrize has partnered with WOOD TV8 to present a Community Celebration at Rosa Parks Circle and invites everyone to join in the festivities. This city-wide street party will kick off at 5:00 p.m. EDT with a live concert featuring local bands Troll for Trout and Domestic Problems. Several local food trucks will be on hand serving up tasty treats, and for those attendees 21 years of age and older, Founders Brewing Co. will be pouring several of their brews, including their 2014 ArtPrize Beer, Mosaic Promise—valid state ID is required to receive a wristband and purchase drink tickets. A jumbotron at the Rosa Parks Circle stage will begin live event coverage from the Grand Rapids Civic Theatre at 7:00 p.m. EDT, and the 2014 ArtPrize Awards will commence at 7:45 p.m. EDT. Emceed by Todd Herring, ArtPrize director of marketing and communications and 10-year River City Improv veteran, the evening promises to be entertaining, funny, and at times irreverent. Reflecting on the full 19 days of ArtPrize 2014, the ceremony will recognize the ArtPrize education programming, presented by PNC Bank and delivered in partnership with numerous partner organizations, announce the winners of the inaugural ART21 Young Filmmakers Award, and of course reveal the winners of $560,000 in prizes decided by public vote and expert jury. A comprehensive restructuring of the awards format for ArtPrize 2014 brought about parallel tracks of Public Vote, sponsored by Meijer, and Juried Awards. For the sixth annual event, Artists submitted their work into one of four categories: 2D, 3D, Time-based, and Installation. The Public Vote will for the first time mirror the Juried Awards, as this year both the public and Category Jurors will award $20,000 within each category. The expert jury will award a fifth Category Award not to an Artist, but to the curator selected for the Outstanding Venue Juried Award. The new award structure will also include two $200,000 Grand Prizes, one chosen by public vote and one awarded by a panel of three art experts. Following the announcement of the ArtPrize 2014 winners, the two awards celebrations will join together as Grand Rapids Civic Theatre attendees are led from the theatre and down Monroe Center Street by a special musical performance to join the Community Celebration at Rosa Parks Circle. The ArtPrize 2014 winners will take the stage to meet the public, and the celebration will continue until 11:00 p.m. EDT. The Public Vote, central to the ArtPrize event, is generously sponsored by Meijer, and the 2D and 3D Public Vote $20,000 category awards are presented by Foremost Insurance and Deloitte, respectively. The juried category awards are also presented by ITC, Your Energy Superhighway (2D), Haworth (3D), Grand Valley State University (Outstanding Venue), and Kendall College of Art and Design of Ferris State University presents the $200,000 2014 Juried Grand Prize. ArtPrize 2014 will take place from September 24 to October 12 in Grand Rapids, Michigan—when 1,536 entries at 174 venues will vie for a combination of public vote and juried awards totaling $560,000. For more information, visit artprize.org.